However, these superficial reasons aren’t what develops winners of DECA glass, instead it's the reward reaped through perseverance and hard work. Whether you are running for office, competing in your respective event, or winning a D4DC scavenger hunt, that moment of glory on stage is unlike any other. I can say that there truly is nothing better than raising that DECA glass (or medallion depending on district awards ;) above you like Mufasa holding Simba in the Lion King as many competitors admire your success. Last year, I advanced from the District 4 CDC to state. My upperclassmen friends had told me how difficult the road beyond state to ICDC would be, saying that “The other kids are getting almost perfect scores on their tests and role-plays and even if you are perfect, it’s still the luck of a draw”. I never had that officer to tell me that going to ICDC would be a feat someone like me could achieve. As a result, I prepared much less that I should have, taking about two practice tests and a couple roleplays. During testing, I rushed because of the seemingly nonexistent possibility of reaching ICDC even with a good test score. Given my pessimism, I went to state without pressure and with a cool aura around me. As a result, the role-plays I did at SCDC had turned out to be successful and I knew I had maximized both role-plays despite my lack of specialized preparation. My words flowed eloquently and the thoughts were conveyed cohesively as the analogies and jokes I mentioned spiced up the act for the judges. Still, I woke up on Awards Day thinking that the most I could’ve achieved was a pat on the back from my amazing advisor, Mrs. Ash, after she saw my score report. With my event being near the end of the ceremony, I remember the moment my name came upon the screen- at first, a moment of shock and non-realization but after comprehending it, a surge of excitement and happiness in my body. Running up to the stage and receiving congratulations from all the 170+ chapter members added to the emotion. When I went to ICDC, I had some of the best times of my life and I met friends from across the globe that I’ll never forget. This time I made sure I was much more prepared for competition. Although many don’t reach ICDC, the learning opportunities through failure should be used as your motivation to keep moving forward and coming back stronger than next year. 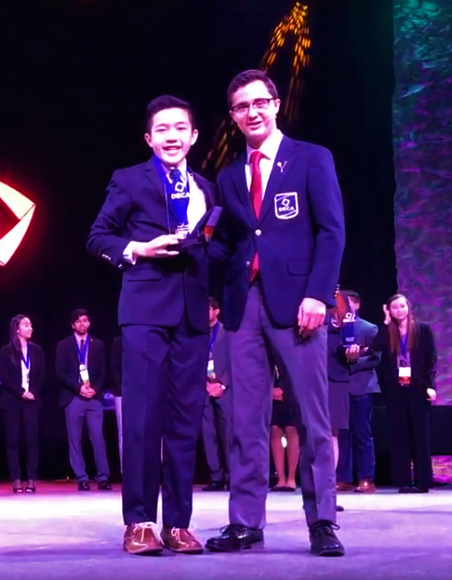 Therefore, when people ask why they should work to earn their DECA glass, I tell them about my once in a lifetime experience of holding that glass up and how it is achievable and realistic. It’s vital we express to our competitive members that this road is not only possible for them, but that their work and preparation will directly influence and better their chances of getting the famous #DECAglass.